Stephen King's second novel, the classic vampire bestseller 'SALEM'S LOT, tells the story of evil in small-town America. 'Salem's Lot is a small New England town with white clapboard houses, tree-lined streets, and solid church steeples. That summer in 'salem's Lot was a summer of homecoming and return; spring burned out and the land lying dry, crackling underfoot. Late that summer, Ben Mears returned to 'salem's Lot hoping to cast out his own devils and found instead a new, unspeakable horror. A stranger had also come to the Lot, a stranger with a secret as old as evil, a secret that would wreak irreparable harm on those he touched and in turn on those they loved. All would be changed forever: Susan, whose love for Ben could not protect her; Father Callahan, the bad priest who put his eroded faith to one last test; and Mark, a young boy who sees his fantasy world become reality and ironically proves the best equipped to handle the relentless nightmare of 'Salem's Lot. This is a rare novel, almost hypnotic in its unyielding suspense, which builds to a climax of classic terror. You will not forget the town of 'salem's Lot nor any of the people who used to live here. 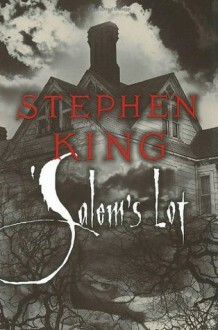 1.24.19-I just finished my third read of SALEM'S LOT, this time via audiobook. The narrator, Ron McClarty worked well for me and I found this tale as satisfying as it ever was. http://oblue.booklikes.com Obsidian Blue 3.0 Whatever Happened to Ben and Mark? text Whatever Happened to Ben and Mark?